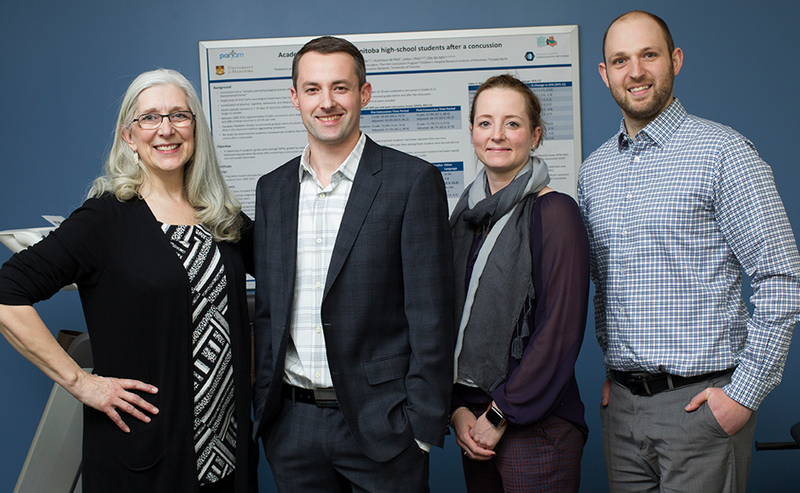 Pan Am Concussion Program team members, from left: Karen Reimer, Dr. Michael Ellis, Dr. Lesley Ritchie and Dean Cordingley. It was like loading the ark just as the first drops of rain began to fall. In the autumn of 2013, the Pan Am Clinic launched one of the first and finest pediatric concussion programs in the country. And as soon as the doors opened, the patients came aboard. "From Sept. 1, 2013 to Dec. 31, 2013, we saw a total of 45 patients," says Dr. Michael Ellis, recalling his first few months as director of the program. Soon the boat was overflowing. In the program's first full year, Ellis saw 200 patients. By last year, the figure had climbed an estimated 900 patients. "Every year we've seen an increase of approximately 100 to 200 patients," says Ellis, noting that the clinic recently recorded 100 patient visits in four days. As the numbers suggest, the opening of the Pan Am Concussion Program was a timely response to an emerging health problem. As a result, it is fair to say the program has come to be seen over the years by patients and parents alike as a reliable ark in the nightmarish storm of traumatic brain injury. Credit Dr. Wayne Hildahl, the long-time Executive Director of the Pan Am Clinic, for recognizing that the concussion case dam was about to break. Thirty years ago, people didn't worry much about concussions. But that started to change in the mid-2000s with news reports that some professional athletes were beginning to experience longer-term health issues associated with concussions and repetitive head injuries, including depression, cognitive impairment and the development of neurodegenerative disease. Hildahl knew that it would only be a matter of time before the public - especially parents of young athletes involved in team sports like hockey, football, soccer and basketball - would start to take notice of the potential health risks associated with hits to the head. In an interview with Wave in 2012, he predicted that Manitoba would see a "tsunami" of new concussion patients in the years to come. In order to meet the anticipated demand for specialized care, Hildahl launched an effort to develop a local concussion program, one that would tackle the issue on three fronts. It would, of course, provide the very best care possible to concussion patients. 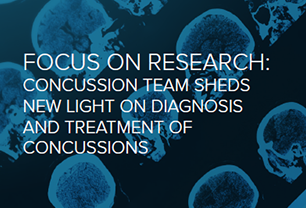 But it would also carry out important research on concussion-related issues and participate in community-based efforts to raise awareness about concussions and how they might be prevented. A concussion is defined as a short-term loss of brain function resulting from a mild blow to the head. Symptoms may include loss of consciousness, short-term memory loss and headaches. Generally speaking, concussion symptoms will resolve with time, although longer-term consequences are possible with repeated injuries. The brain is surrounded by a fluid that protects it from the mild bumps and movements that accompany daily life. However, a sudden impact, from a blow to the head or rapid acceleration, can cause the brain to move around or jiggle causing a concussion. A concussion disrupts normal brain signals but does not normally result in structural damage. As such, CT and MRI scans are typically normal in patients with concussion. Once the vision was set, Hildahl convinced a number of partners to support it, including the Manitoba government, True North, the Winnipeg Regional Health Authority, the Pan Am Clinic Foundation, the University of Manitoba's Faculty of Health Sciences, and Health Sciences Centre Winnipeg's Children's Hospital. After lining up the partners, Hildahl recruited Ellis, a neurosurgeon who also happened to be one of the best young concussion experts in the country, to lead the program. Ellis was well-suited to the job. He grew up in the small hockey and lacrosse town of Orangeville, Ont., and played volleyball for the University of Manitoba Bisons squad while obtaining his undergraduate degree. His brother, Dan Ellis, was a goaltender in the NHL with half a dozen teams, and is currently a scout with the Chicago Blackhawks. "We are, in many ways, further ahead than anyone else," Hildahl is quoted as saying when the concussion program opened. "To have the opportunity to have a neurosurgeon who's dedicated to research and clinical work in concussion full-time, that's a once-in-a-lifetime." Today, if you must have a concussion in Canada, Manitoba is probably the best place to have it, especially if you're under the age of 20. 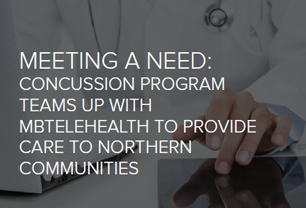 The concussion program was initially located at the Pan Am Clinic on Poseidon Bay, and moved to the Bell MTS Iceplex in 2014. Having the program operate out of a clinic on the second floor of the Iceplex keeps the issue of concussions uppermost in the mind of the local hockey world. The Pan Am Concussion Program is pediatric, which means it only sees patients under the age of 20. The exception is a separate agreement with the Manitoba Junior Hockey League, which includes players in their early 20s. Another exception is the Winnipeg Jets, but those are private agreements between the team and some Pan Am Concussion Program professionals, including Ellis. Patients are treated by the same professionals who see professional hockey players. "Every kid in Manitoba has access to the same level of care as the Winnipeg Jets," Ellis says proudly. For those who have never been inside the Iceplex, it's an experience. The 72,000-square-foot building, which is owned and operated by True North Sports and Entertainment, is woven into the small subdivision of car dealerships off Portage Avenue called Pointe West Auto Park, just west of the Perimeter Highway overpass. The first time you navigate the winding roads feels like the hunt for the Minotaur of Greek myth, passing line after line of shiny new vehicles in place of hedgerows. You end up inside the hallowed halls of the Iceplex and its four hockey rinks, one in each corner of the building like foundation pads. You can go to the second floor and look out over each one like a Roman emperor. 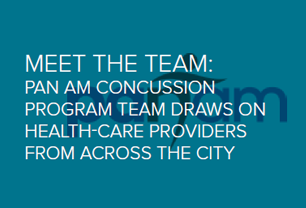 But what really sets the Pan Am Concussion Program apart from any other in the country is its approach to diagnosing and treating patients. The program uses a multidisciplinary model of care involving 19 health-care professionals, including neurosurgeons, neurologists, neuropsychologists, sports medicine physicians and physiotherapists. They're not all under one roof. Health professionals at the Bell MTS Iceplex include Ellis; Dr. Lesley Ritchie, a neuropsychologist; Karen Reimer, a vestibular physiotherapist; and Dean Cordingley, an exercise physiologist. The remaining program team members are off-site but available through direct referral, and include a cervical spine physiotherapist, psychiatrist, neuro-ophthalmologist and headache neurologist. Require all youth and their parents to undergo annual concussion education. Require all students or athletes with a suspected concussion to be immediately removed from play and undergo medical assessment by a physician or nurse practitioner. Require all athletes to obtain written medical clearance before returning to sport activities. In preparation for this legislation, which has been tabled but not yet passed, Ellis has assisted the Winnipeg School Division to become the first school board in Canada to establish a division-wide concussion protocol. He is also working with Sport Manitoba to develop concussion protocols for Manitoba's provincial sport organizations. What also makes the Pan Am Concussion Program special is that it's the only provincially-funded pediatric concussion program in Canada. That means provincial oversight and coverage for virtually all costs, except cervical spine physiotherapy for whiplash-type injuries. Concussion clinics in other parts of the country are either university-based or private sports clinics, where patients pay out of pocket for additional testing, like neuropsychological testing, and for physiotherapy. Neuropsychological testing can cost from $1,000 to $2,000, and physiotherapy can be another $500. The lack of consistency in concussion care across the country is an issue. A CBC report in 2016 referred to concussion care as the "Wild West" of health care, with numerous start-up private clinics claiming to provide expert concussion care, with little government oversight to ensure their practitioners are qualified and delivering evidence-based care. "It's an unregulated field, where massage therapists, chiropractors and nurses can hang out a shingle, pitching their expertise in concussion management," the report said. The report tallied more than 200 concussion clinics across Canada offering such unproven treatment as meditation, acupuncture and even hyperbaric oxygen therapy, a well-established treatment for decompression sickness that people get from scuba diving. Of the 200 clinics, 60 per cent did not have access to a medical doctor. The situation irritates Ellis because these clinics often don't pick up on additional injuries or medical conditions. Patients presenting with concussion-like symptoms can indeed have other undiagnosed conditions such as hypertension, cancer, epilepsy, depression and migraines. The undiagnosed conditions can complicate treatment of these patients and can sometimes be life-threatening if not properly identified. "Because our government has invested in a concussion program operated by experts in traumatic brain injury, we don't have this problem in Manitoba," he says, adding that the Winnipeg clinic can serve as a prototype for the rest of the country. The multidisciplinary model of care being used at the Pan Am Concussion Program has proven hugely beneficial for patients. The case of 16-year-old Brandyn Ronyck illustrates the point. Brandyn suffered his first concussion about three years ago. He was skating along the boards in a game for the Midget AAA Winnipeg Sharks when someone hit him from behind. He got up and went back into the play, but his dad, Bob Ronyck, was concerned. "I suffered four concussions myself," says Bob - once while playing defensive end for the St. Vital Mustangs, twice in car accidents, and another time during track and field. "I know concussions." The football injury was 35 years ago. His teammates helped him off the field. He sat on the bench feeling woozy but when he saw his D-line back on the field again, he ran out just as the ball was snapped and got clobbered again. He blacked out. People knew little about concussions back then, he says. After Brandyn got hit, his dad watched him more closely. "He didn't look right to me out there." Bob went around behind the bench and demanded that the coach take him out. "Everyone was looking at me. I just knew something was wrong because of what I'd gone through," says Bob. Bob Ronyck says his son, Brandyn, benefitted from the care provided through the Pan Am Concussion Program. Sure enough, the young hockey player would be diagnosed by Ellis with a concussion and associated whiplash-type injury. "I've heard stories from other hockey parents of their kids suffering concussions and having trouble focusing. Some couldn't watch TV (as part of treatment). One kid couldn't even focus in school. That to me is very scary," says Bob. People sometimes try to normalize concussions by comparing them to something like an ankle sprain. The sprain needs to be immobilized so it can heal. You give it time and slowly increase activity until it feels back to normal. But your brain is a little more complicated than an ankle. You don't think with your ankle. In some cases, symptoms may include loss of consciousness and headaches. In more complex cases, symptoms can include exercise intolerance, vestibular dysfunction (dizziness), cervical spine injuries, migraine headache, and mood-related conditions. The challenge is to treat patients so they can recover from a concussion fairly quickly without experiencing recurring symptoms over the course of several months or a year. As a result, it is extremely important to ensure a patient suspected of having a concussion is properly evaluated. Diagnosing a concussion is no simple thing. There is no failsafe test for a concussion - no X-ray, CT scan or MRI that can confirm a diagnosis. In the end, the diagnosis comes down to the clinical judgment of a trained physician. As Ellis explains, in the case of patients with persistent symptoms, the goal of the evaluation is to determine the cause of the patient's symptoms and then determine which health-care provider is best qualified to manage those symptoms. At the Pan Am Concussion Program, patients receive a neurological assessment by Ellis to rule out co-existing neurological conditions or spine injuries. Depending on the circumstances, the patient may then be referred to an exercise physiologist who will give the patient a treadmill test to determine how high they can raise their heart rate before feeling symptoms associated with concussions. Always wear protective equipment when partaking in sports, such as hockey. Although equipment will not prevent a concussion, proper helmets and mouth guards can reduce severity of injury. Practise good sportsmanship. Don't bodycheck someone from behind. Sporting organizations should consider changing rules to reduce the risk of head injuries. Play smart. Be aware of where the other players are on the ice. Do not skate close to the boards. Face the other player. When accidents do happen, concussions can be severe. It is important to understand that receiving a second blow to the head before the first injury is fully healed can be fatal, even if the second injury seems minor. All athletes with a suspected concussion should be immediately removed from play and undergo assessment and medical clearance by a physician prior to returning to sports. Specific treatments are tailored to the needs of the individual patient. In some cases, it may involve rest and light exercise. In other cases, it might mean working with a vestibular physiotherapist to correct problems with dizziness or vision. In many cases, an adult patient who has suffered a concussion can recover in as little as two weeks with rest. A pediatric patient may take twice as long to recover, and those with complex symptoms may take even longer. Interestingly, there have been relatively big changes in concussion treatment in recent years. For example, it is now understood that an athlete who returns to physical activity too soon after a concussion can suffer a second, more serious one with chronic symptoms. That's because the concussed brain is in a state of heightened vulnerability. A second concussion before a first has healed often worsens the original symptoms and not only prolongs recovery but can, in rare instances, result in malignant brain swelling and cerebral edema. Another change involves treatment techniques. In the recent past, basic concussion treatment included abstinence from any bright lights, whether night headlights, sunlight, white boards, television, or a computer or cell phone screen. All of these can trigger headaches. Parents had to stash their kid's cell phone in a wall safe for the treatment period of perhaps two to three weeks. In some cases, kids were made to lie in their room in the dark for days. But the standard has changed over the past few years, says Ellis. Today's concussion patients are treated by gradual integration back into the lights and activities of everyday life. Kids can play with their electronics, but on a limited basis. The fluorescent lights of most schools still pose one of the biggest challenges for kids recovering from concussion, but even so, kids typically only miss a few days of school now. They might start going back for half days. Following these graduated steps, a person can begin light exercise so long as it doesn't bring on symptoms like headaches or dizziness. 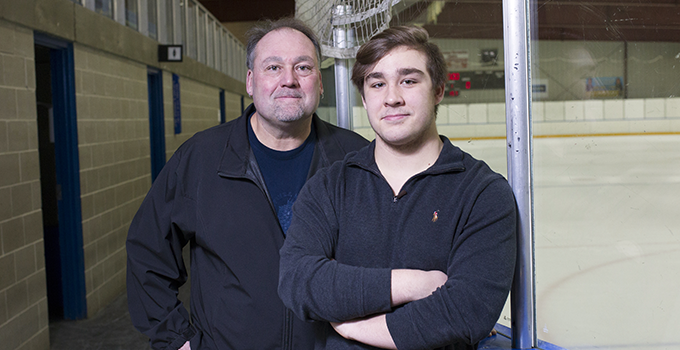 It took Brandyn about five weeks to recover from his first concussion, but it would not be the last time he would require the services of Ellis and his team. A couple of years later, he was back playing hockey again, and going into the corners as he liked to do. Then during one game he was skating into a corner and his skates lost an edge. He crashed face-first into the boards. "He was lying on the ice and he wasn't getting up. Then he rolled over and looked right at me. Then I knew something was wrong," says his dad, Bob. A trainer with the team came out to check on the young player. Brandyn said his neck and back hurt, and the trainer initiated the Winnipeg AAA Hockey concussion protocol. Brandyn knew something was wrong, but he didn't think he had a concussion. After being notified of his injury by Winnipeg AAA Hockey, staff at the Pan Am Concussion Program phoned Brandyn and asked him to come to the clinic. Ellis examined Brandyn and reviewed his diagnostic imaging studies that had been completed the night before in the emergency room. They agreed with him that it wasn't a concussion. They did an MRI the next day that confirmed the presence of a fractured T1 vertebra. It was hard to see, but the battery of specialists, including a radiologist at the Pan Am Concussion Program, had gone over the imaging and found it. "Thank God for Dr. Ellis," says Bob. "Brandyn was scheduled to go back to playing hockey on Monday. He could have ended up paralyzed. Dr. Ellis went above and beyond with his care." It took a year to heal, but Brandyn is now back playing hockey, although at a less competitive level. Ellis credits the clinic's multidisciplinary team with spotting Brandyn's neck fracture and preventing him from injuring it further. That approach to care also benefitted Tyson Verhelst. Tyson was a goalie from Brandon who had pro scouts drooling over him from the time he was 13. That's when agents began phoning the house. In 2012, at the age of 14, he was rated one of the top six goalies in the country for his age group. At age 15, he received a trip to Toronto to attend the Allstate Mentorship Cup. A total of 42 kids in his age group were brought in from across Canada with all expenses paid, including the airfare and accommodations of one parent. The National Hockey League Players' Association was a sponsor. Kids even got free equipment - in Tyson's case, new goalie equipment. When Tyson turned 16, he was advised to move up a league and play for the Neepawa Natives of the Manitoba Junior Hockey League, rather than staying with his AAA team. He played in the under-18 world championships for Team West when he was 16. Eventually, he would sign with an agent and get drafted by the Spokane Chiefs of the Western Hockey League. "Thank God for Dr. Ellis . . . (My son) could have ended up paralyzed. Dr. Ellis went above and beyond with his care." Tyson's experience with concussions started when he was playing goal for the Natives in 2014. "I went down to cover the puck at the side of the net and the opposing player, after the whistle, drove the net and his knee hit the back of my head, which then drove my head into the ice," he explains. His mother, Leslee Verhelst, says Tyson continued to play despite the hit. "He played the rest of the game and he really shouldn't have," she says. But after the game, Tyson knew something was wrong. "I just really didn't feel like myself. I had a big headache, and for the next couple of days I didn't sleep." Three days later, Tyson visited a doctor, who determined that the young player had suffered a concussion. He would not play another game for the rest of the season. As time passed, Tyson continued to experience headaches and other symptoms of concussion, says Leslee. "I really noticed extreme mood changes. It was night and day. It always seemed he was tired and if you tried to talk to him, he'd blow up at you. That wasn't Tyson." After about three months, Tyson started to feel better. He spent the summer of that year working out and preparing at attend training camp for the Spokane Chiefs in the fall. Everything went fairly well for Tyson in that first year at Spokane. Then in the fall of 2015, Tyson would suffer the first of two more concussions. The first occurred when he collided with two players, including one from his own team, behind his net. "After that one, I kind of just remember waking up in the dressing room." Three weeks later, Tyson was back on the ice again. Today, he acknowledges that he probably needed more time to heal. "I don't think I fully recovered from the second concussion," he says. But at the time, he felt a certain amount of pressure to return to the lineup from his teammates and coaches. "We were doing really well until that point, and then they were kind of struggling. So I felt like I needed to hurry back." 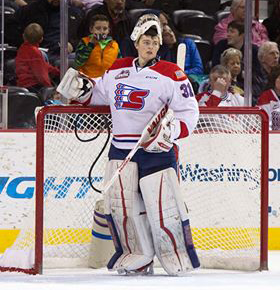 Tyson Verhelst in goal for the Spokane Chiefs. "I just really didn't feel like myself. I had a big headache, and for the next couple of days I didn't sleep." Then, in March 2016, Tyson suffered another concussion during a game in Victoria. He went down to block a shot from the blue line, and an opposing player in front of him swung around, hitting his knee on Tyson's head. "The contact of the knee wasn't extremely hard," says Tyson, "but just with past concussions and still feeling symptoms from my second concussion, it was enough to give me my third concussion." It's true that once you've had a concussion, it's easier to get a second. Many kids will have several concussions. About 40 to 50 per cent of the patients seen at Pan Am have a history of previous concussions, says Ellis. After Tyson's third concussion, the Chiefs' general manager and his agent arranged to have the young goaltender visit the Pan Am Concussion Program in Winnipeg. By that time, Tyson was having trouble with his vision. His eyes wouldn't focus, and he had trouble following a puck. Ellis put him on a schedule of sub-maximal aerobic exercise as well as balance and eye co-ordination exercises with a vestibular physiotherapist, a member of the clinic's multidisciplinary team. "I remember he had a string with a bead and he had to play with it and follow the bead," says his mom. "If they hadn't strengthened his eyes, he probably wouldn't have been able to go back." In the summer of 2016, Tyson was traded from Spokane to Red Deer. Unfortunately, soon after arriving in the Alberta community after being treated for his last concussion, Tyson slipped on some ice while walking from his billet's home and hit his head. He saw Ellis again, who told him he could get him playing hockey again but he couldn't guarantee what his life would be like if he got another concussion. Recognizing concussions requires awareness of the problem on the part of all concerned: players, coaches, officials and parents. Coaches must be up to speed on the latest information about concussions, learn about the kinds of situations that can lead to concussions, and recognize potential symptoms in players. Likewise, players must understand that coaches watching a game may not always see a hit on a player than can lead to a concussion. That's why it is important for young athletes to tell their coaches any time a hit leaves them feeling dizzy. All youth athletes with a suspected concussion should be immediately removed from play and undergo urgent medical assessment by a physician or nurse practitioner. Dr. Peter MacDonald, Head of Orthopedics for Pan Am Clinic and Leader of Orthopedics for the Winnipeg Regional Health Authority, says the problem of concussions in sports creates special concern in areas where access to care is more difficult. In rural areas, he says, there's an even stronger onus on the coach to make sure that a player with a suspected concussion gets to a regional hospital where they can be diagnosed. "Most concussions don't get diagnosed properly," says MacDonald. "Most of the time, the kid comes off the ice and has a bit of dizziness. That was enough for Tyson. By age 19, he was no longer playing hockey. He currently works with young goalies in the minor hockey program in Lethbridge, Alberta. It's a way of staying in the game and helping others. He is also attending college in Lethbridge and is considering a career in law enforcement. "I'm proud of Tyson for the decision he made," says Leslee. "His health is more important. And I'm even prouder that he's paying it forward and helping young kids." She is also grateful to the concussion program, and only wishes she had got Tyson in from the beginning. "Doctors like Dr. Ellis are one in a million," she says. "I feel he's a doctor who really cares about his patients. You have a name. You're not just a file number." Hailey Karbonik has also been treated by staff at the Pan Am Concussion Program. 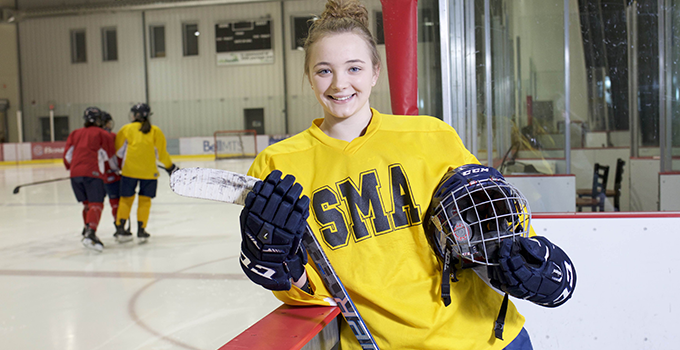 A 17-year-old defender for the girl's hockey team at St. Mary's Academy, Hailey was on the ice during a tournament game in Hamilton last September when she was checked into a stanchion that holds the glass along the rink's boards. "I was skating the puck up the ice, and it wasn't really a hit, it was just a nudge into the boards, and my neck stopped where the glass starts. I was going quite fast so my upper body stopped but my legs kept going," she says. Hailey does not recall much after the incident, but she does remember arriving at the hospital in Hamilton with a headache and a sore neck. She also remembers being temporarily paralyzed. "I wasn't able to move my body at all," she says. Fortunately, Hailey regained the use of her arms and legs within a few hours, and was deemed to be fit enough to travel back home to Winnipeg later that day. She was examined by local doctors again and eventually landed at the Pan Am Concussion Program. After an examination, Ellis determined that Hailey had probably suffered a spinal cord injury as well as a concussion. Hailey Karbonik prepares for practice at Bell MTS Iceplex. The injury caused Hailey to miss about 10 days of school, and she was off the ice for nearly eight weeks. During this time, she wore a neck brace and adhered to a treatment program that included visiting the clinic once a week for a checkup. Part of the routine at the clinic included undergoing electromyography testing, which involved inserting small needles the size of a paper clip into Hailey's hands and feet to test for nerve damage. She also underwent cognitive testing, which primarily involved memorizing lists of words. "Through the weeks, I felt like I was healing because I could remember more words," she says. As the headaches and neck pain started to become less intense, Hailey was allowed to return to the ice, alone at first for short, limited workouts, and then, eventually, for a full-scale practice. During this time she was also on the treadmill at the Pan Am Concussion Program Clinic, testing to ensure she could get her heart rate up without incurring concussion symptoms. "It was a slow process, to make sure I was fully healed," she says. As one might expect, Hailey's mom, Kathy Karbonik, was extremely concerned when her daughter was injured. But she felt better after talking to Ellis, who took the time to explain the extent of Hailey's injuries and the timeline for recovery. "They made us feel a lot more at ease at that point," she says. By late November, the neck brace was off and Hailey was ready to play hockey once again. About two-thirds of all concussions seen at the Pan Am Concussion Program are sports-related. "That was an exciting but nervous time for me," Hailey says, noting that the big question in her mind was whether she would be able to play a full game without experiencing concussion symptoms. As it turned out, Hailey was able to play with her school team at a tournament in Detroit, and then joined Team Manitoba for a tournament in Quebec in December. Everything went well. "I'm happy it turned out that way because it meant that I was okay," she says. Next year, Hailey is planning to attend the University of Ottawa on a hockey scholarship. When the Pan Am Concussion Program started, it was common for staff to see patients who were referred with symptoms lasting for six to 12 months or greater. "We were routinely referred patients with chronic and persistent symptoms," says Ellis. That has largely stopped as primary-care physicians have become able to more quickly recognize symptoms of concussion and refer patients to the Pan Am Concussion Program sooner. The early diagnosis and treatment translates into better outcomes, says Ellis. "I believe more patients are being referred to our clinic in the earlier stages of injury, and thus we are able to address some of the causes of their symptoms (exercise intolerance, vestibular and cervical spine dysfunction) earlier and prevent patients from developing persistent symptoms that are associated with a deterioration in mood, school, and social functioning," he says. The result is the program is seeing a significant decrease in the number of patients who go on to have these chronic symptoms and conditions, including mood disorders. But difficult cases still come up. A concussion will never be as ho-hum as an ankle sprain. There can be other physical issues that complicate recovery. As Ellis says, there is still much work that needs to be done on concussions in terms of improving techniques for diagnosis and treatment, not to mention better understanding the long-term effects of traumatic brain injuries. And if the last few years are any indication, a lot of that work will be carried out at the Pan Am Concussion Program.